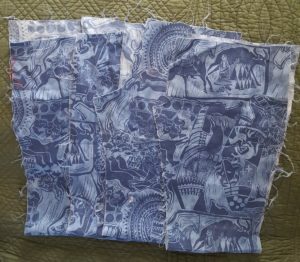 I told myself a few days ago that I was done posting about the fabric I was finding at Mom’s, but I promise, just one last one. In the spirit of Ugly Christmas Sweaters, I offer this fabric. 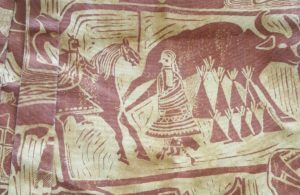 On its own, this pseudo Native American – Phoenician woodcut fabric is appalling. Is there any way to make this any worse? Well yes, by God, there is a way to accentuate the hideousness of this material! Even with the pattern perfectly matched, these pants are an absolute monstrosity. If rust britches don’t suit your fancy, how about blue? I’m not sure why my mom never finished these, and how I escaped wearing these things. And it’s easy for me to sit here and blame my mom about making me these ugly pants, but what if that’s not really what happened? 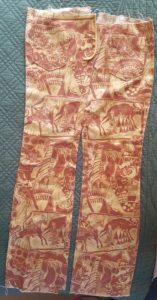 What if I picked out this appalling print and asked my mom to make me these pants, and she conveniently “lost” them as to prevent me from going out in public in them? We’ll never know now, will we? As it stands, Mom is in a nursing home, and if she want to counter anything I say here, she can write her own blog. Until somebody can prove otherwise, I’m dumping this one on her.